The Polynesians first reached Samoa at about 1000 BC. By 600 BC, they had established a settlement on Tuta at Tula. They built up a settlement at Tula. Over the centuries, the Samoans kept in contacts with the neighboring islands of Western Polynesia, Tonga and Fiji. In 1956 Peter Tali Coleman became the first Samoan-born governor and during his term protection for the islanders against the alienation of their lands and loss of culture was approved in 1960 and subsequently the Flag of American Samoa became official. In 1961, President John F. Kennedy appointed H. Rex Lee and generated massive funds to develop Tutuila, financing the building of an international airport, port facilities, roads, schools, houses, a hospital, a tuna cannery, a modern hotel and installing electricity throughout the 1960s. This massive development came at the exact time that the political future of American Samoa was uncertain given that Western Samoa became independent of New Zealand in 1962 and effectively stamped American authority over Tutuila as a dependency. In July 1997 Western Samoa, by legal agreement, changed the country's name from Western Samoa to Samoa. This was opposed by the Americans, including the American Samoan islanders who believed that the name diminished their sense of identity and still use the terms Western Samoa and Western Samoans. Left: Pago Pago Harbor. Right: Closer view of Pago Pago Harbor. 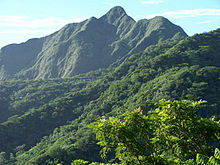 The economy of American Samoa is dominated by grants from the U.S. Department of Interior. The tuna canning and fishing industries provide the majority of the GDP, although tourism is a promising developing sector. Economic activity is strongly linked to the US with which American Samoa conducts most of its commerce,  although American Samoa does not treat the US as an external trade partner. Funding from the US government adds substantially to American Samoa's economic well being. Attempts by the government to develop a larger and broader economy are restrained by Samoa's remote location, its limited transportation, and its devastating hurricanes. Hurricanes are relatively infrequent and although they sometimes cause substantial damage, the total number of deaths from hurricanes in the past 50 years is estimated to be less than 5. Therefore, hurricanes are simply an inconvenience and certainly not the economic development curtailing events portrayed in many writings. More than 90% of the land is communally owned. Tuna fishing and tuna processing plants are the backbone of the private sector, with canned tuna the primary export. Urban development has taken roots in Pago Pago Harbor where fisheries and its allied industries of canneries have been established. The largest Tuna processing plant in the world, known as StarKist, is located in Atu'u, across the bay from Fagatogo. In the harbor there is a workshop of the Marine Railways, which takes care of the maintenance and repair of fishing ships. Tutuila Amalu Bay in National park Service Area. Left: U.N. Air Rescue Helicopter during rescue operation in Pago Pago. Right: Destruction to a boat due to Tsunami in Pago Pago. Hurricanes or tropical cyclones have been frequently striking the Samoan Island for centuries. To monitor and give advance warning of the cyclones, several Observation stations have been established under the U.S. Federal Emergency Management Agency (FEMA), in American Samoa. After the first recorded hurricane (at least in modern times) hit the Samoan islands on February 10, 1966, which was declared a major disaster, "hurricane homes" called as "fale afa" have been built in the islands for people to take shelter during cyclonic storms. After the hurricane in 1966 the islands have witnessed many disasters due to heavy rains, hurricanes and drought; due to drought in 1974, due to floods, mudslides and landslides in 1979; and due to hurricanes in 1981, 1987, 1990, 1991 and 2004; and a tsunami in 2009. The hurricane of December 4–13, 1991 was the worst disaster faced by entire group of Samoan Islands which was named " Hurricane Val," which caused immense damages to property in the American Samoa and Western Samoa. The Hurricane Val in comparison to past hurricanes, was very severe and the storm force had a wind velocity of over 100 knots or 166 km (103 mi)/hour. It was reported as the worst in 100 years in its intensity of wind force and the severity of the damage caused in the island. According to the history of the National Oceanic and Atmospheric Administration's (NOAA) American Samoa observatory, "Hurricane Val" struck the Tutuila Island from December 7 – 10th. The hurricane's eye passed over the southern end of the island with winds as high as 116 mi (187 km) recorded at the observatory. In the Fagatele Bay of the Tutuila Island where the Hurricane Val made a direct pass over Tutuila the coral reef was completely destroyed, a large strip of the coast was also eroded. ^ a b c d e f g h Stanley, David (2004). Moon Handbooks South Pacific. David Stanley. p. 475. ISBN 978-1-56691-411-6. Retrieved December 18, 2010. ^ a b c d e f g h i j k "Islands of American Samoa (United States)". Tutuila (391). UN System-Wide Earthwatch Web Site. Retrieved November 24, 2010. ^ a b c d e Dragicevich, Peter; Craig McLachlan (2009). Lonely Planet Samoa & Tonga. Lonely Planet. pp. 84–85. ISBN 978-1-74104-818-6. Retrieved December 18, 2010. ^ a b c d e f g David Stanley (1985). South Pacific handbook. David Stanley. pp. 230–. ISBN 978-0-918373-05-2. Retrieved 21 December 2010. ^ a b c d e f g Brij V. Lal; Kate Fortune (2000). The Pacific Islands: an encyclopedia. University of Hawaii Press. pp. 560–. ISBN 978-0-8248-2265-1. Retrieved 21 December 2010. ^ a b "Tutuila: Eastern District and Western District". United States Census Bureau. Retrieved December 19, 2010. ^ a b c "Travel distance calculator between cities". Map Crow. Retrieved December 19, 2010. ^ The Nautical magazine. Fisher, Son & Co. 1840. p. 754. Retrieved December 19, 2010. ^ a b "Economy of American Samoa". Nation Master Encyclopedia. Retrieved December 19, 2010. ^ a b c d "Effect of Cyclone Val on areas proposed for inclusion in the National Park of American Samoa" (PDF). A report to the U.S. National Park Service. Botany.hawaii.edu. pp. 3–4. Archived from the original (PDF) on January 4, 2012. Retrieved December 18, 2010. ^ "FEMA posts 11 disaster declarations for territory over last 40 yrs". Samoanews. November 4, 2010. Archived from the original on July 17, 2011. Retrieved December 18, 2010. ^ Ward, R. Gerard; Paul Ashcroft (1998). Samoa: mapping the diversity. editorips@usp.ac.fj. pp. 17–21. ISBN 978-982-02-0134-7. Retrieved December 17, 2010. ^ "Fagatele Bay Marine Sanctuary". Research and Monitoring. Official Site of the Fagatele Bay National Marine Sanctuary. Retrieved December 17, 2010. Siebert L, Simkin T (2002–present). Volcanoes of the World: an Illustrated Catalog of Holocene Volcanoes and their Eruptions. Smithsonian Institution, Global Volcanism Program Digital Information Series, GVP-3 ( http://www.volcano.si.edu). Wikimedia Commons has media related to Tutuila Island.